Citing the threat of rising seas, the Battery Park City Authority (BPCA) is set to replace Battery Park City’s Robert F. Wagner Jr. Park—Machado Silvetti and OLIN’s 3.5-acre wedge near the south tip of Manhattan, offering panoramic views of the Statue of Liberty—with a new topography filled with deployable barriers and flood-proof landscapes. 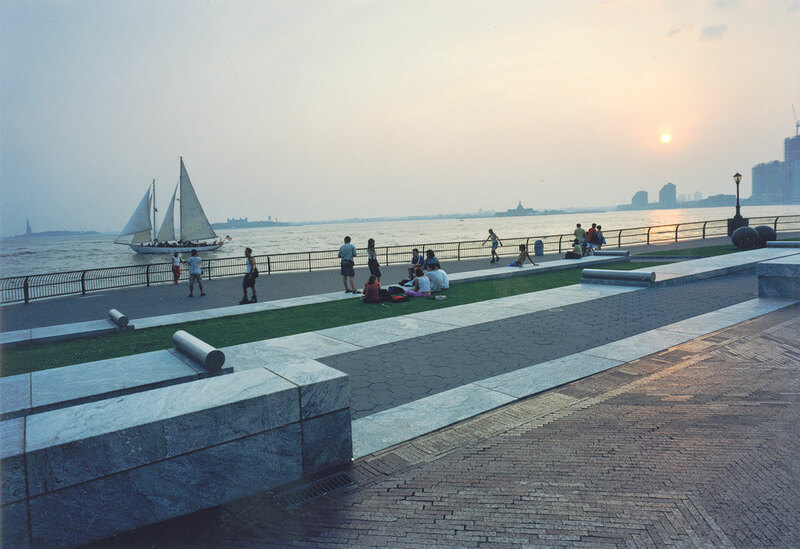 After Wagner’s 1994 opening, critic Paul Goldberger called the park “one of the finest public spaces New York has seen in at least a generation.” Its main elements include two pavilions joined by a wooden bridge; ornamental gardens; a central lawn; and grass, stone, and brick allées that lead people from Battery Park to Battery Place. Following the Lower Manhattan Coastal Resiliency Project (LMCR), the BPCA has stated that OLIN’s park and Machado Silvetti’s buildings would not be able to protect inland areas from floods. Initial conceptual designs by Perkins Eastman and W Architecture and Landscape Architecture called for deployable barriers contouring the existing buildings; increased maintenance and food services; and a new complex of flood-resistant lawns, gardens, cultural facilities, wetlands, and esplanades. On July 14, the BPCA issued an RFP for the final design, due September 29. The winner’s task, according to the RFP, is to advance the conceptual plans through to construction documents. “This project seems totally non-site-specific; the symbolic content of the park is completely lost. It’s very banal,” said Rodolfo Machado, principal of Machado Silvetti and one of a chorus of designers railing against the conceptual plans. Several city officials and residents have spoken out in support of a plan they see as vital to the area’s future. According to a BPCA spokesperson, the agency is exploring design and engineering plans for the revamp, now officially called the South Battery Park Resiliency Project, through 2018. It plans to select a firm to lead the project early that year, and site work will begin in the latter half of 2019.